I punched him because he’s so impatient and couldn’t wait for me to write this post about biking to go cross country skiing. He was in such a rush, he even made a spelling mistake! Over the last three years, I have become pretty focused on using my bike as my primarily means of getting around Kitchener-Waterloo. My wife and I have three teenage sons, and until recently, two vehicles. I have been advocating getting rid of the car and just having one vehicle, for a couple of years now. My wife takes the mini-van to work, and my oldest son used to take the car to work. My idea of going down to one vehicle has been met with some resistance! I have finally succeeded, mostly thanks to my middle son for wrapping the car around a tree! Fortunately, there were no injuries, but we now have only one vehicle! This was a long introduction to say that, I used to bike most places because I wanted to. However, I always had the option of taking the car, if I was running late, or was a bit tired. Now, I often don’t have another option. It’s made me come up with some innovative ways to haul things around. The picture of the skis on my bike is actually from last year. I only rode to a ski trail once last year. It was a bit of a novelty. Since mid-January, if I’ve wanted to ski, I’ve usually had to bike. I’ve made the trek out to Schneider’s Bush several times, with my skis strapped to my bike. I get a few strange looks, and a few of my skiing friends waffle between being impressed and thinking I’m a bit nuts! Here’s a few pointer, if you’d like to try. I like to have the tips of the skis up front. I tried them the other way around once, and They ended up with quite a bit of slush and dirt on them. I’ve also discovered that it’s best to have the tips just ahead of the handlebars. If I have the tips any farther forward, the skis are too thick where my legs pass the bar. The bindings would be the worst part to have between your legs! ah Chris there’s a spelling mistake in the following line …. Not sure what you’re talking about, Graham. It looks fine to me! 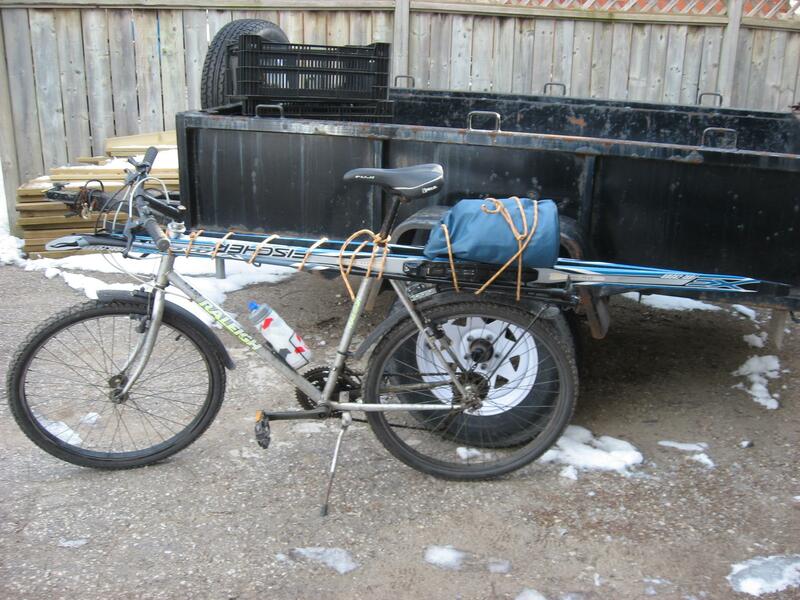 My partner did transport his skis …5 blocks from storage place to home when he was moving. Slow moving bike in downtown traffic. Goodness that car end, must have been a weird experience for you –but at least no one was hurt?? A serious lesson learned for jr. Do your boys bike much at all at this time? Thanks Jean! No one was hurt, so the lesson was just expensive, not painful. My two youngest boys do some biking in warmer weather, but not in the winter. My oldest son has not been interested in biking in the past. However, he just moved to Montreal and is talking about taking his bike there in the spring. So Chris, do your boys bike much? Hi Ed. Our boys bike a bit, but not a lot. I’m actually gathering some rough thoughts for a blog post on raising teens in a crazy culture. I’d really like it if our sons embraced active transportation more fully. Welcome to the 1-car family! I’m glad nobody was hurt in the crash (not even the tree, from the look of it). We went to one car back in 2005, but I had to make myself sell the second car in June — no way could I have done it in the middle of a snowy winter. Since then we’ve made it work because I bike (walk/run/bus) most places, and my wife really stepped up to schedule driving and coordinate ride-sharing for things like kids’ sports. Of which there is a lot, with much travel over the years. I would like to get down to zero cars, but with five householders, four playing hockey, that step might be a few years down the road yet. Thanks Tim! I am happy about being a one-car family, even if I wasn’t happy about the accident. Selling the car and getting even a little bit of cash would have been preferable to sending it to the wrecking yard! We haven’t found the transition very challenging. I was already used to biking most places. My wife does most of the afternoon transporting of kids. I do more of the evening taxi duties. 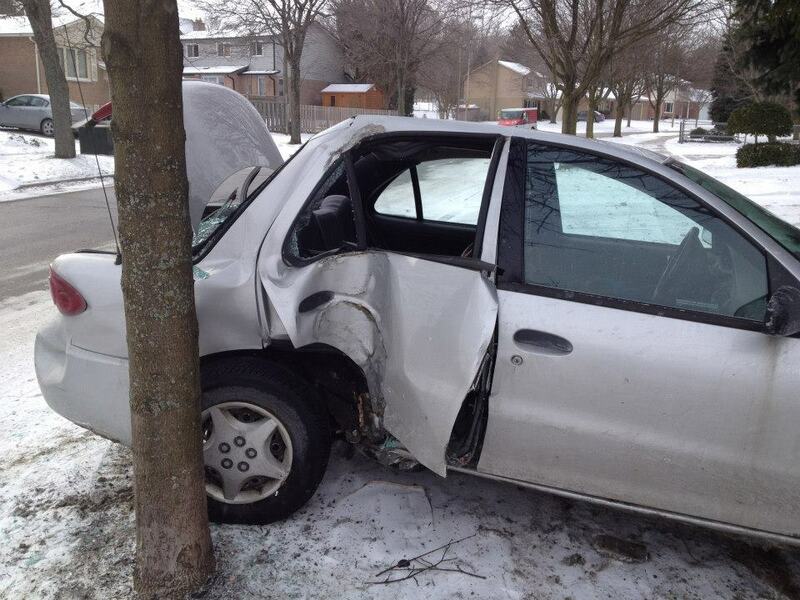 It has helped that our oldest son (who drove the second car the most) moved to Montreal two weeks after the accident. It decreased the driving demand substantially.